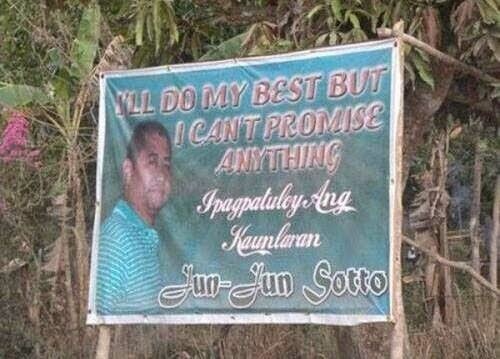 A politician with an honest banner that says, “I’ll do do my best but I can’t promise anything,” got the interest of ajarn.com and posted the said photo on their Facebook page. I did some digging and found out that some people already wrote articles regarding his “honesty” as an aspiring public servant. Finally a truthful politician. Jun-jun Sotto, you’ve got my vote, weknowmemes.com said. John Rentoul of blog.independent.co.uk said, Jun-Jun Sotto is a Filipino politician who understands expectations management. And of course from ajarn.com – At last, an honest politician. Why can’t they all be like this? Unfortunately, I can’t seem to find whether he won the election and what particular post did he run for. If he won, I wish he did exactly what he told the people. As for the rest out there, I wish they’ll learn the value of honesty and trust. May they also learn to walk their talk which, in all honesty, is no longer of concern to them as long as they got what they want.